The PennDOT Workers’ Memorial, which honors the 88 employees who have lost their lives in the line of duty since 1970, was displayed on the District Office lawn. The Pennsylvania Department of Transportation (PennDOT), the Constructors Association of Western Pennsylvania (CAWP) and the Pennsylvania State Police held a media briefing to urge safe driving throughout work zones in the region. As part of the event, the PennDOT Workers' Memorial, which honors the 88 employees who have lost their lives in the line of duty since 1970, was displayed on the District Office lawn. Current PennDOT employees paid their respects by placing a single white flower in front of each memorial. The memorial, made up of reflective vests and hardhats mounted on stands, traveled around the region. As a reminder, PennDOT urges motorists to practice safe driving behaviors. Drivers must turn on vehicle headlights in all posted work zones, drive with extreme caution and abide by posted speed limits. Motorists caught driving 11 mph or more above the speed limit in active work zones automatically will lose their license for 15 days per state law. 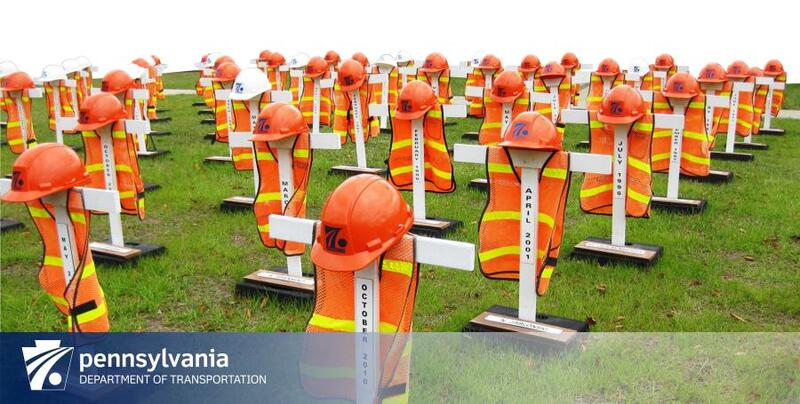 For more information, visit penndot.gov/safety.